The left side is the rain-gage network, and the right side is the stream-gage network. 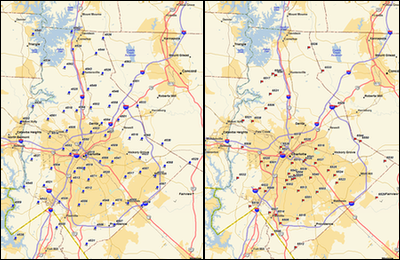 The Charlotte-Mecklenburg Flood Information and Notification System (FINS) consists of over 125 gaging stations spread across a relatively small area surrounding Charlotte, North Carolina. The majority of the stations monitor precipitation, while the rest monitor precipitation and water level. These monitoring stations then use the Automated Local Evaluation Real-Time (ALERT) protocol and analog UHF radios to transmit data to a base receiver when predetermined thresholds are exceeded. In the past, during storm events a large percentage of data was being lost due to packet collision and frequency contention. In order to improve overall network performance, Distinctive AFWS Designs was contracted to develop a system that enhanced the overall efficiency of the network by increasing data throughput and decreasing packet collisions. In order to achieve this goal, Distinctive AFWS Designs designed a system that used a CR850, four RF500M radio modems, and the power of CRBasic programming. The multifrequency repeater receives incoming ALERT binary data on two separate frequencies and then decodes them. The ALERT data is then checked against a pass list, translated, concentrated, and then retransmitted via a third RF500M. The repeater ingests two separate ALERT streams and outputs a single, concentrated stream to make the retransmission more efficient. The fourth RF500M is used to take advantage of Campbell Scientific’s TD-RF protocol. LoggerNet software is used to collect complete logs of and statistics about the ALERT traffic. Additionally, it is used to configure and administer the repeater. The CR800 is able to log statistical information such as bytes received on each port, number of valid ALERT packets received, and number of ALERT packets retransmitted. Each inbound packet is individually time stamped and recorded with other statistical information about the packet. A CSV file loaded into the dataloggers CPU drive is read in and interpreted by the program. This CSV file contains a pass list of IDs (either individual or a range) and information on how to translate the IDs if needed. This allows for changes to be made to the repeater remotely and without having to edit the program. If the user wants to add or remove IDs from the repeater pass list they simply modify a master spreadsheet and load the file into the datalogger—which can be done remotely. By deploying two multifrequency repeaters in parallel, FINS has added a layer of redundancy to the network and dramatically reduced the number of ALERT packets lost to collisions. Through use of the TD-RF protocol and a CRBasic program with built-in diagnostics and status monitoring, FINS is able to quantify how well the system is performing, collect historical data for troubleshooting and backup, and perform maintenance functions remotely.